Test Happens - Teledyne LeCroy Blog: Is Your Testbench Mixed-Signal Ready? Mixed-signal design is ubiquitous these days, with hybrids of digital and analog circuitry turning up everywhere. A typical mixed-signal designer may be a hardware or software engineer with specific needs. They may be working with 4-bit, 8-bit, 16-bit, and 32-bit microcontrollers in a single embedded controller or across several embedded systems. They need to capture a host of different signal types and serial-data protocols and understand timing relationships between them. Then there's all the different sensor signals, power-supply signals, and PWM control signals to guarantee embedded system performance and reliability. Further, mixed-signal design touches a large number of application areas, including appliances, audio, automotive, avionics, consumer electronics, industrial equipment and automation, medical equipment, military hardware, networking equipment, motor control, power conversion, power supplies, and more. So it behooves just about any designer or design team to ensure that they have test and measurement equipment that is up to the task. Of course, an oscilloscope is a top priority for mixed-signal design. With it, the designer or technician can usually make do for the analog aspects of the circuitry. For the digital portions, a logic analyzer comes into play. The best option is a mixed-signal oscilloscope that adds dedicated capabilities for acquiring and analyzing digital signals. Besides the obvious addition of some number of digital input lines, a mixed-signal oscilloscope provides such capabilities as analog/digital cross-pattern triggering (Figure 2). With it, you can create complex analog and digital pattern triggers to isolate problems. It enables searching for timing errors by specifying a trigger for an invalid digital state. 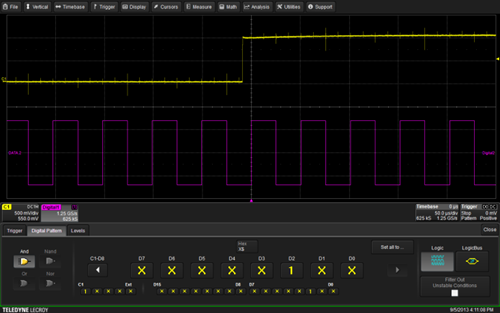 Another key advantage of a mixed-signal oscilloscope is digital pattern search and find. This capability allows the user to search across many digital lines to find specific digital patterns. Once the desired pattern is found, oscilloscopes such as Teledyne LeCroy's HDO-MS models enable you to automatically zoom in on the relevant portion of the waveform. Digital pattern search and find is ideal for searching for timing problems where invalid patterns may occur. In the case of the HDO-MS oscilloscopes, all of the instrument's powerful measurement tools are available for use on the digital lines. Measurements include delay, delta delay, Dtrig time, duty, frequency, half period, period, and width. Functions such as histicons, statistics, tracks, and trends show you how the measurements are changing over time. A useful feature of the HDO-MS oscilloscopes is activity indicators for the digital lines (Figure 3). These indicators let you see the current state (high, low, or transitioning) of all of the digital lines at a glance. They can also help you quickly identify lines that are incorrectly hooked up, such as to ground or to a power-supply line. The indicators are active even when the oscilloscope is not triggering. For these reasons, among others, mixed-signal design and debug is best approached with an instrument that is suited for the task, such as the Teledyne LeCroy HDO-MS (an added benefit on the analog side of the equation is HD4096 technology). 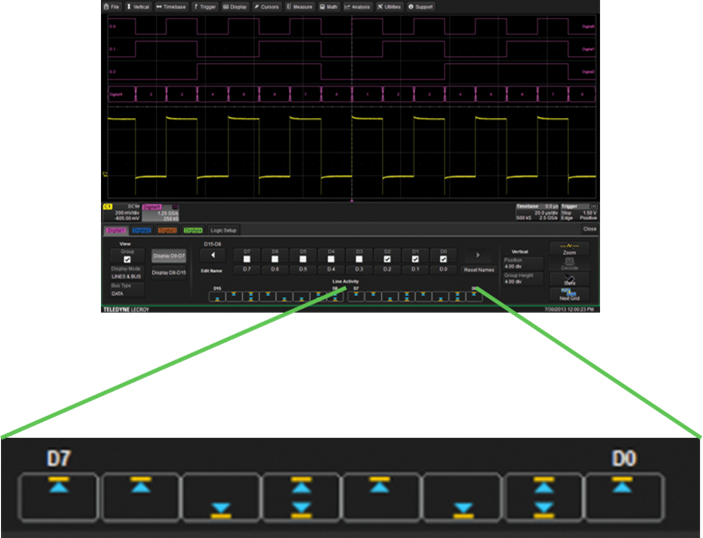 A mixed-signal oscilloscope integrates all of the best aspects of a traditional oscilloscope and a dedicated logic analyzer, and thus is among the best options for the mixed-signal testbench.